1/35 scale assembly kit depicting infantrymen from the British 8th Army which fought in the North African desert during WWII. Special Feature 1 Each figure is depicted in tropical uniform. 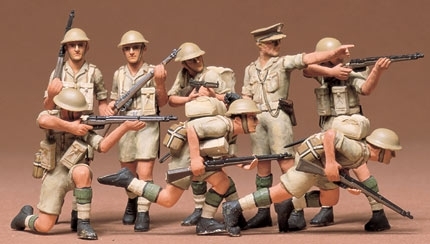 Special Feature 2 Set includes a total of 8 figures: 1 commander urging his unit forward, 4 standing rifle men, and 3 riflemen in assault poses.